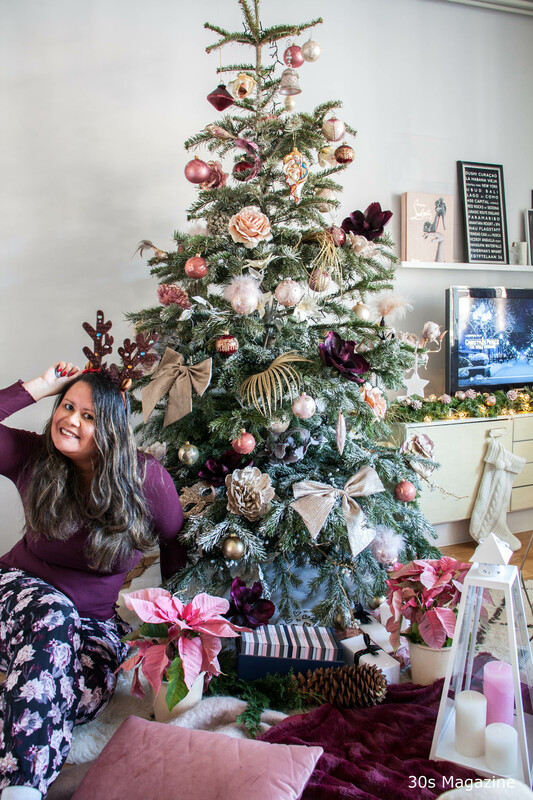 In today’s blog post, days before Christmas, I would like to reveal this year’s Christmas tree and my festive tablescape. If you’ve been following my blog from the beginning you know I always do this just before Christmas because it takes me several weeks to get it all done. Setting up the tree usually takes me a whole weekend and I keep adding new baubles until Christmas. It’s never finished in my opinion. My table decor is something I do a few days before Christmas. This year I have a Nordmann tree since I wanted a tall tree again. As a colour scheme I chose pink, burgundy red and gold. My most beautiful bauble this year is one I found last week of Maria, Josef and baby Jesus. My table decor is art deco inspired with a soft pink table cloth and baubles from Sissy Boy Homeland. And here’s a photo of my tree without the lights on. Isn’t it dreamy? My pajamas and reindeer socks are matching with my interior, but I didn’t plan that. They are from Hunkemöller.